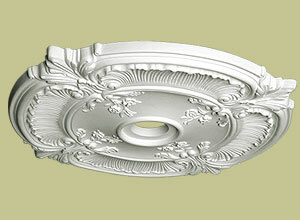 Bring your fixture to life with a ceiling medallion! Ceiling Medallions originated in the Middle East and their popularity later spread throughout Europe, particularly in France and Italy. A ceiling medallion expands the visual height of a room, and our medallions come in a vast array of sizes and styles, from classical to contemporary. 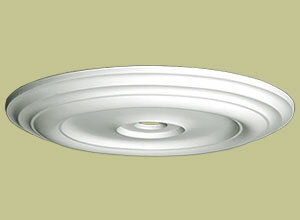 Chandelier ceiling medallions are available in oval or circular shapes. In the early days, ceiling medallions often served a practical function. Once modern lighting fixtures became the standard, ceiling medallions served primarily as a decorative treatment to draw the eye to the chandelier or lighting fixture. It accentuates and highlights your fixture while providing an elegant look by expanding the visual height of room. 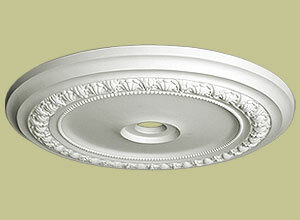 Our ceiling medallions create a focal point to your dining room or foyer and enhance your light fixture or chandelier. We carry both classic as well as contemporary designs to match today’s home interior design and style. 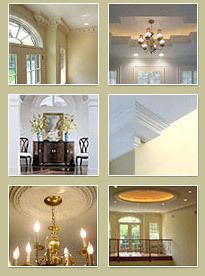 Chandelier ceiling medallions are available in various decorative styles and in many shapes and sizes. You can use a small sized medallion to add a touch of class to an intimate space, or a large medallion to make a grand statement in rooms like ballrooms or catering halls. Please visit our installation guide page for complete instructions on how to install our ceiling medallions.